Whether you’re seeking to guarantee the security of your merchandise, personnel, or customers, the goal is to decrease your risk and liability with highly trained, vigilant security guards equipped with the technology and experience to do their job effectively. Facility Directors and Property Managers want security personnel who can solve problems, de-escalate potentially harmful situations, and confront challenges based on professional training and real-world experience. When security challenges arise, how will your retail, commercial, or corporate security team react? 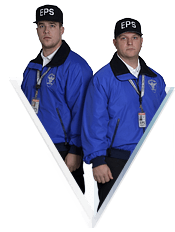 Our certified commercial security guards are fully capable of securing and protecting people and property in any industry, and we will work with you to develop a customized security plan specific to your requirements. We welcome you to test our guards and experience our value on trial basis, because we are confident that you will quickly discover why we are the corporate security provider of choice for both the private and public sector. An effective security guard not only acts as a deterrent, but understands how to respond appropriately when a problem arises. Confronting security challenges and solving problems requires experience, training, and the ability to use common sense and think on your feet, so that potentially harmful situations can be responded to and resolved before they grow out of control. This holds true whether your security guards are protecting merchandise from the loading dock to the retail floor, patrolling a parking area after hours, or offering on-site security within a corporate environment. From handling retail security services to dealing with public security in emergency situations, our guards are capable of ensuring the safety of your employees and customers while ensuring your property is safe from fire, theft, trespass, vandalism, or other potential risks. Our security guard vetting and training process is exhaustive, and all guards are required to document their work and verify their activities. We also assign site supervisors to ongoing clients. This is important, because it gives you peace of mind that your security guards are doing the job you’re paying them to do, 24/7. Depending on the nature of your retail, corporate, or commercial security needs, your security guard may also be trained to operate surveillance equipment or on-site alarms and safety equipment. Highly trained security guards must be equipped with the equipment and technology that allows them to quickly and efficiently handle any situation that may arise. This is true in any retail, commercial, or corporate security situation, and when dealing with public security measures. First and foremost, your security professional will be dressed in the appropriate uniform to help deter unlawful or unwanted activity, depending on your security challenge. Whether dressed in a highly visible uniform, business attire, or in plain clothes, your security guard will arrive clean, neat, and well groomed. We understand that your guards are a reflection of your image and reputation. Standard equipment for your security guards may include radio, flashlight, cell phone, and ID badge, and they can be trained to use whatever technology and equipment necessary within your specific environment. From ongoing retail security services to emergency response, our flexibility allows us to provide you with the same quality service no matter the situation. In a crisis response situation, public security may only be needed for a few days, but in a commercial environment you may need reliable public security that spans years. Comprehensive training gives our security guards a distinct edge when handling unlawful or unwanted situations, giving them the confidence to respond properly to emergencies, hazards, crisis, and threats. Echelon’s Officer Reporting and Tracking technology provides guards with a cutting-edge tool to record and document their duties, while allowing you access to review their reports online 24/7. This means you can track any situation in real-time, and ensure that the money you’re spending on security is being well spent. At Echelon, we are proud to offer unmatched flexibility, so that you can customize a security strategy that meets your needs and budget. Our security experts understand your industry required flexible, cost-effective security solutions that may change due to seasonality and circumstance. We work as your reliable partner 24/7 to develop your own security team. Contact the corporate, retail, and commercial security experts at Echelon today, and let us help you reduce liability while protecting people and property in any industry.